It's not a topic you hear much about, with good reason. While more new cars are now sold in China than in any other country, most of the top ten manufacturers report that warranty costs are a minor expense. And even though the competition is fierce, warranty remains a minor concern. China has now taken its place alongside Japan, Germany, and the United States as one of the world's great car countries. In fact, more new vehicles were sold in China last year than in either Europe or North America. It's also arguably the world's most competitive auto market, with at least twelve China-based manufacturers and dozens of their joint ventures and subsidiaries making, importing, or exporting more than a hundred different nameplates. But unlike markets such as Australia, Europe, or the U.S., where warranty is both a major cost and a huge part of the brand image, in the Chinese automobile industry, warranty is a relatively small expense and just a year or two of coverage seems to be no impediment to sales. JAC, also known as JAC Motors, formally called the Anhui Jianghuai Automobile Company Ltd., and formerly known as the Hefei Jianghuai Automobile Factory. All ten report their sales in Chinese yuan, a currency that has ranged in value from 14 to 16 U.S. cents per yuan over the past decade (roughly seven yuan to the dollar). So the 2,150 billion yuan these and other auto companies reported in sales last year was the equivalent of roughly US$306 billion. And the 10.725 billion yuan we estimate that all Chinese automakers reported in 2017 claims payments was equal to about $1.5 billion U.S. dollars -- about twice as much as Deere & Co. spent on warranty work worldwide last year, or roughly half as much as Daimler AG. The difference is, however, that Deere spent $743 million on claims while selling $25.9 billion worth of products. Daimler set aside 3.4 billion euro in warranty accruals against 164 billion euro in revenue. 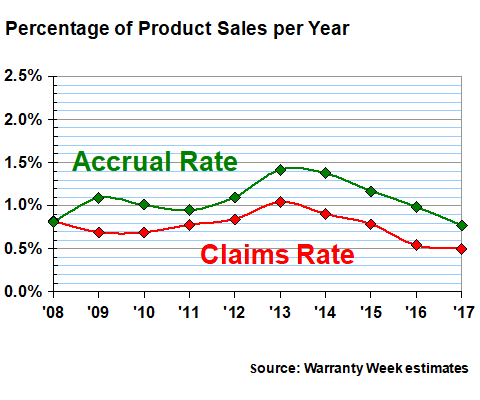 In other words, warranty claims were a much bigger expense for them, consuming a much higher percentage of sales revenue. If Chinese manufacturers paid claims at the same 2.9% rate as Deere, the bill last year would have topped $8.8 billion, not $1.5 billion. If Chinese car manufacturers set aside warranty accruals at the same rate as Daimler does, the industry's accrual total would have been more than three times larger. However, in China, claims and accrual rates under one percent are the norm. According to our calculations and estimates, the top five automotive warranty providers based in China are SAIC Motor, the FAW Group, Dongfeng, BAIC Motor, and Changan Automobile. Together, these five paid more than three-quarters of the country's total claims last year, as evidenced by this pie chart. SAIC, the largest among them, spent just over 3 billion yuan, or about US$433 million, on warranty claims past year. That's a little more than either Cummins or Navistar spent on claims, and somewhat less than we estimate was paid out by either Renault or Suzuki, which is why the company didn't make it into the worldwide claims chart included in the August 16 newsletter. In other words, they may sell more product, but they spend much less on warranty per unit. We should note that Volvo Cars, based in Sweden, is actually now a subsidiary of Zhejiang Geely. However, the warranty metrics included here are for its sister company, Geely Automobile Holdings, which is also a subsidiary of Zhejiang Geely. Other subsidiaries include the London Taxi Co. and Lotus Cars, which are both based in the UK. We estimate that Volvo Cars had twice the sales and paid more than ten times as much claims as Geely Automotive did last year. In fact, we estimate that all Chinese auto manufacturers spent only about twice as much as Volvo cars alone did on claims last year. But Volvo Cars has a 2.9% claims rate while the Chinese industry has only an 0.5% claims rate. Most of these manufacturers are in one or more joint ventures with Japanese, Korean, French, German, or American automakers. For instance, SAIC Motor is in joint ventures with both Volkswagen and General Motors. The FAW Group works with both of those as well as with Toyota and Mazda. Dongfeng has joint ventures with both Renault and PSA Peugeot Citroen, as well as with Honda, Kia, and Nissan. The BAIC Group has joint ventures with Daimler and Hyundai. Changan Automobile has joint ventures with Ford, Mazda, PSA, and Suzuki. Great Wall works with BMW. GAC Motor has five foreign partners: Honda, Toyota, Fiat, Isuzu, and Mitsubishi. JAC Motors used to work with Hyundai and Navistar, and now works with Cummins in a diesel engine joint venture. And then there are various cross-ownership arrangements as well. Daimler owns about 10% of BAIC. Geely owns about 10% of Daimler. Dongfeng owns about 14% of PSA. Berkshire Hathaway owns about 25% of BYD. In Figure 2, we're detailing what we believe to be the annual claims payments of all ten of the China-based automakers over the past decade. 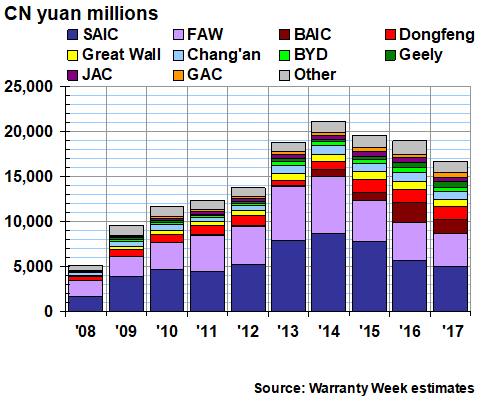 The gray section at the top represents all the "other" companies, either solo or through joint ventures with Asian, European, or American automakers, that paid less claims than JAC Motors, which we estimate spent about 245 million yuan on claims last year. Notice that industry claims were highest in 2014, and were also high in both 2013 and 2015. We estimate that both SAIC Motor and FAW Group paid more in claims those years than they have recently, causing the overall total to peak in 2014 at 13,975 million yuan (about US$2.19 billion). Meanwhile, sales continued to increase, both in terms of units sold and revenue, which means the industry's claims rate has begun to fall as well. Only three of the Chinese automakers fully report their warranty claims, accrual, and reserve totals: Dongfeng, Changan, and BAIC. SAIC, GAC and another smaller player called Brilliance Auto provide their accrual totals along with their warranty reserve opening and closing balances, which allows us to calculate the missing claims figures. Others such as Great Wall provide only their opening and closing balances, and in their statement of cash flows, the amount of difference between them. Several of the non-reporters are government-owned enterprises, which means they typically don't publish their financial statements, much like a private company. We estimate that the Chinese automakers set aside roughly 16,670 million yuan in accruals last year, the equivalent of US$2.37 billion. SAIC Motor and FAW Group were again in the lead, but BAIC and Dongfeng swapped places, and Great Wall moved up to fifth place. Once again, the industry's accruals peaked a few years ago in 2014, and have been declining ever since. And once again, it's not sales related. Instead, sales have risen, which means the accrual rate is also now declining, as we will see in Figure 5. 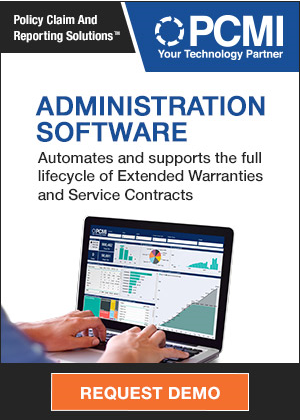 This means either the cost and/or the frequency of warranty work is declining, which implies either a gain in quality or reliability, or a decline in labor and parts costs. We're not sure which it is, so perhaps readers more acquainted with the local market can help us fill in the blanks. 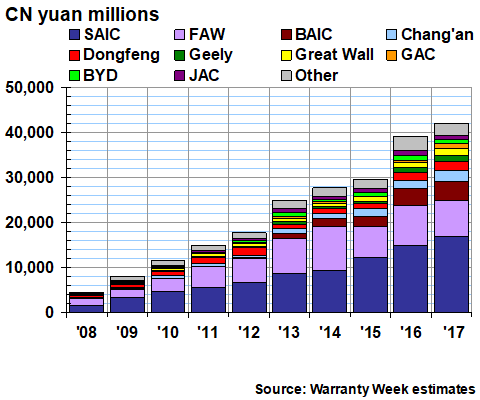 In Figure 4, we're counting the year-ending balances in the warranty reserve funds of all the Chinese automakers. The estimated total as of December 31, 2017 was 41,920 million yuan, which is equivalent to about US$5.96 billion. SAIC Motor and FAW Group remain in the lead, and BAIC remains in third place. But Dongfeng falls to fifth and Great Wall falls into seventh place, as Changan and Geely move up a notch. JAC Motors, which had the smallest warranty reserve balance among the ten companies named in Figure 4, had about 830 million yuan in its reserve fund at the end of last year, or roughly as much as either Polaris Industries or Brunswick Corp. had in theirs. 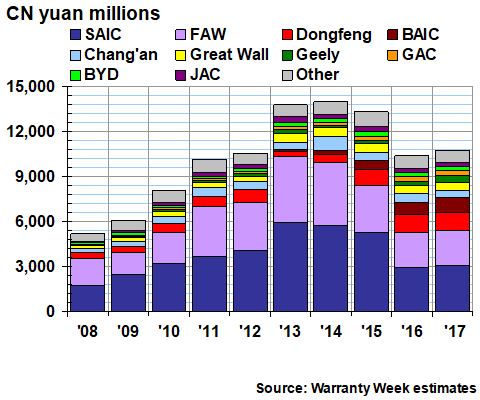 SAIC, the largest of the ten Chinese OEMs we're examining, had about as much in its warranty reserve as General Electric Co. did at the end of 2017. However, none of these Chinese companies are paying warranty expenses at anything close to the rates their American peers are reporting. We mentioned this in the August 16 newsletter, but now we will add some detail. With 2,153 billion yuan in sales, 10.725 billion yuan in claims, and 16.67 billion in accruals last year, we calculate the industry's claims rate to have been only 0.5% and its accrual rate to be less than 0.8%. American or European car companies can only dream of such metrics. Unless we're missing a couple of zeroes (and we were extra careful to note when a given manufacturer was reporting its figures in units of millions or 10,000), those Chinese industry averages are only one-half to one-third the warranty expense rates we found to be prevailing in the U.S. automotive market (see the April 5 newsletter for more), depending on whether we're comparing cars or trucks. Most of these Chinese manufacturers make both, and some also sell engines alone, which is one reason why we won't try to figure out accruals made per unit sold. But still, these expense rates are much lower than those seen for most automotive manufacturers elsewhere in the world. In Figure 5, we're detailing the claims and accrual rates we calculated using the data in Figures 2 and 3. Note that the accrual rate was at a high point in 2013 and 2014, but it still did not cross the 1.5% threshold. It was the same situation with the accrual rate, which rose just above one percent in 2013 but has been below that mark ever since. 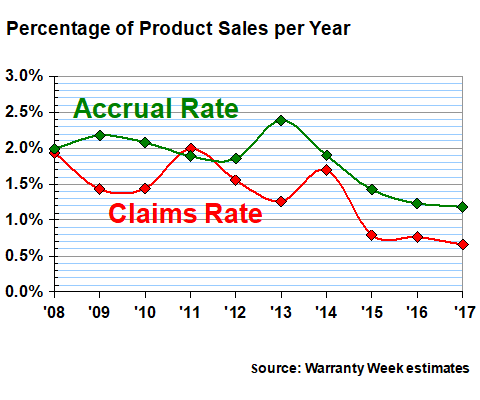 For perspective, let's look at the actual warranty expense data of two Chinese automakers, one with close to average claims and accrual rates, and one with above-average rates for those warranty metrics. In Figure 6 we're looking at the actual reported data of Dongfeng Motor, which is the fourth-largest Chinese automotive manufacturer based on sales, and the third-largest based on claims paid. Dongfeng also shows the 2013 peak, but then expense rates drop off more abruptly in 2014. And from there, rates actually rose in 2015 and 2016, before falling again in 2017. 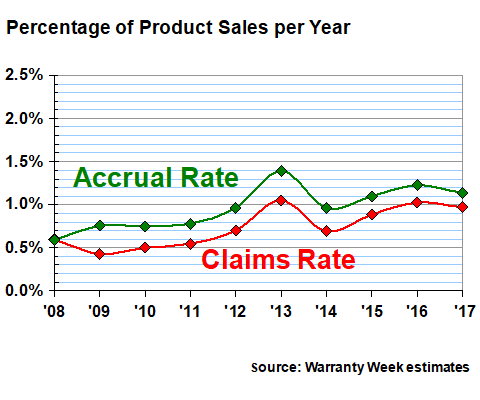 Last year, the company's claims rate was just under one percent (1.18 billion in claims on 121.6 billion in sales), while its accrual rate stood at 1.1%. In the most recent three years, Dongfeng's expense rates have been a little above average, while for the previous seven years its rates were a little below the industry average for China. In Figure 7, we're looking at Changan Automobile. Again, these are actual figures, not estimates. Once again, the company's accrual rate peaked in 2013 (though its claims rate was highest in 2011). And then as with the industry as a whole, warrant expense rates have declined steadily for the past several years. 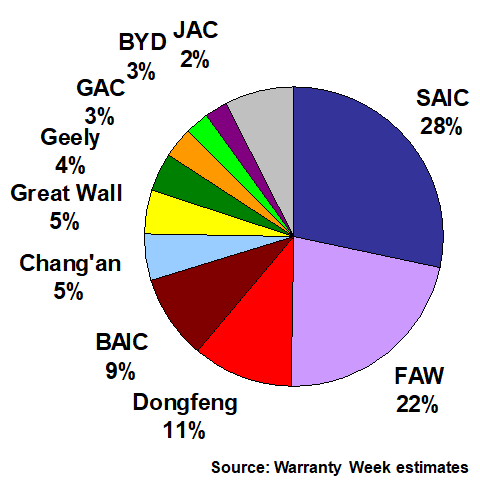 For whatever reason, Changan has the highest warranty expense rates in the Chinese market, according to our estimates. In all but one of the 20 measurements included in Figure 7, Changan was above the industry average (one was a tie). In fact, Changan is the only auto manufacturer based in China to have ever reported a claims or accrual rate above two percent. We dare say that if Changan has the highest warranty costs in China, it would have the lowest warranty costs among any of the major car or truck manufacturers based in the U.S., Japan, or Germany. But while high warranty costs come with the territory across much of the rest of the world, low warranty costs seem to be the norm in China. And that's a product of relatively short warranty durations, low labor rates for warranty work, and minimal customer expectations. Nationwide Marketing Group & Centricity launch service contract program. Canon announces 3-year warranty for office document scanners.